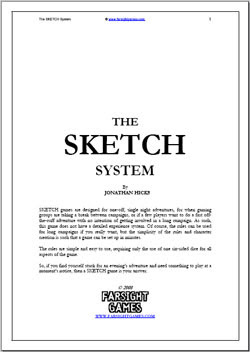 The Sketch system by Jonathan Hicks of Farsight Games is a generic rule system designed for fast one shot play. Print, light the fuse, stand well back and enjoy. What's more Farsight have a load of resources to act as fuel to the fire. The rules are clean, quick and short. So short, in fact, that this review also covers the Bladerunner setting, also free on the site. A Sketch Character comprises of Strength and Skills. Strength is a measure of the amount of punnishment you can take and is calculated by 1D3+2. A value of zero means you fall over with stars circulating around your head and negative values mean that you're dead (not restin', nor pining for the fjords). A character gets six skills as standard and these act as groups for things you do. For example 'Water' is a skill for anything to do with boats, swimming and so on. Some examples are given of the skill groups but more are given in the scenarios (see Bladerunner below). The values of the skills are decided by the player. Rather harshly, you split the values 6,5,4,3,2,1 between each of your skills. And that's it! The suitably simple character sheet has spaces for height, age, weight, description and equipment too but there's no rules for that. Blink and you'll miss it. For task resolution, pick the skill that best matches whatever you want to do, GM gives a modifier depending on how difficult the task is, roll a D6, get under the modified skill value. 1s are always passes, 6s are always fails. Rounds last 5 seconds. For opposing rolls, roll a D6 and add the skill to it, highest wins. Ties mean re-rolls. Ignore the automatic pass/fail for opposed rolls. The amount of damage bleedy-hurty-ness depends on your weapon (head, knife, pistol, orbiting laser). You take the damage off the strength score, healing it back at 1 per 24 hours or some if you can find a doctor. Six pages. There's no fluff. There's more fluff in this sentance than there is in the whole book. There's no pictures, which is a shame. A nice front cover might lift it and the text is large enough for the myopic other half to read from across the room but it's well laid out and the grammar and spelling is good throughout. You can read it and digest it in about 5 minutes. Evenings are a neon-lit, rain soaked vision of bleakness and the daytime of consists of a smog-shrouded sun, the light of which barely touches street level. Writing like that belongs in a full price setting. There is a brief run through of the rules, which only takes a few pages (naturally) and the skills provided are sensible and fit the setting well. There are a few extra rules of vehicle damage (else you might destroy a motorbike by headbutting it three times). All the main parts of the Bladerunner world are described in depth from Voight-Kampff tests through to the Replicants. It reads a little bit more like a description of the finer points of the film, rather than a reference that is easily used by a GM or player. There are some hooks, philosophy and dare I say a just enough fluff to pack a belly button. Although it's written well, it's not quite written to the tennet of 'Run it in a night'. The bare minimum description should be included but after that, there should be a short equipment list, some character types and then a fully featured adventure, with maps, NPCs and a few short things to do. It's recommended that a map of the local town is used but you might not live in a filthy metropolis like I do. 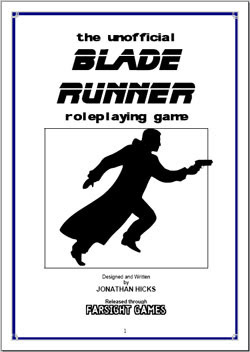 I want to be able to print Bladerunner out, leave it in my gaming bag and then when my overconfident players blow themselves and their planet up in the first eight minutes of a session, I can whip it out (fnar fnar) and we're playing in a very short period of time. The setting doesn't quite do that for me. Beyond Bladerunner, there is a Horror, Star Wars and generic Space Opera scenario. Plenty for any GM to get their teeth into. Given the smart looking website, which is updated regularly (dates are DD.MM.YYYY) I think you can expect more and more from Jonathan. There's no forum but it's obvious that Jonathan wants to be contacted and he acts as Editor for an ezine, ODDS. I'd like to see a forum, hosted on the excellent and not exclusive ukroleplayers perhaps? This review in danger of being longer than the game, which oozes Jonathan's liquid passion. Sketch forfills its desire. It's so fast, you need to down four cans of Coke just to keep up. The system is the perfect substrate for a group of gamers who just want to play something and could grow a game from thin air. The scenarios add a little needed flesh. Bladerunner could be organised a little better but frankly, if I said "It's Bladerunner" to my baby-eating players, within a breath they'd be pulling their PKDs accuse each other of syntheticity (I'm leaving that word in to etymologically irritate my Latin-gobbling wife) before Voight-Kampffing each other and spreading each other over the rain soaked pavement. It would be an evening well enjoyed. Mission accomplished. I love Sketch, it's bloody perfect for its job. 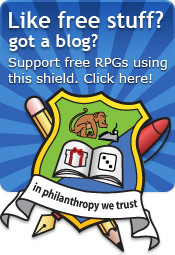 Print it out and stick it into your game bag for when your players decide to tweak the nose of the God-come-evil-personified that you slung into the campaign as an interesting undercurrent but was then sought out by those suicidal story wrecking idiots and suddenly you have a group of slavering players, an evening and you're missing a game. That's a long sentance. You won't find any of those in Sketch! Thanks for the review, Rob, it's very much appreciated. Whilst I'm waiting for the go-ahead for other RPG projects I'm working on adapting an older project of mine into a full 150 page game to be ready in the next few months. I'm using the SKETCH system and some of your points have given me a few things to think about. "A nice front cover might lift it and the text is large enough for the myopic other half to read from across the room but it's well laid out and the grammar and spelling is good throughout."